After the close, President Trump called for another $200 billion in Chinese tariffs. Since the first set of tariffs have not yet gone into effect, this was a surprise. China immediately pledged to fight back "firmly" if the U.S. follows through and publishes and updated tariff list. The S&P futures are down -25 points and the Dow futures are down -250. 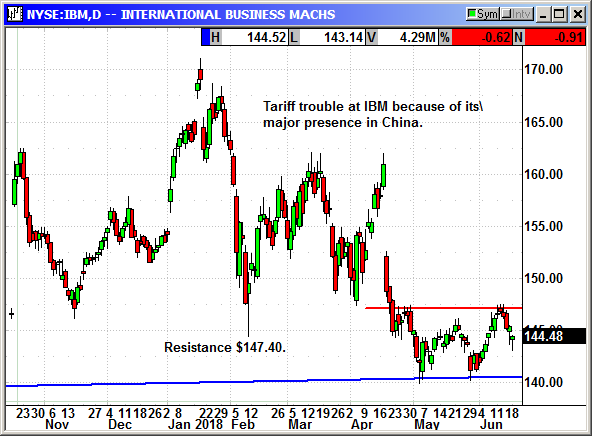 China has already cancelled the deal reached in the prior negotiation and "stands ready to defend free trade." Unfortunately, while that sounds good, trade with China is not free. President Trump told the US Trade Representative to identify $200 billion worth of Chinese goods for additional tariffs of 10%. The duties would take effect "if China refuses to change its practices, and also if it insists on going forward with the $34 billion in tariffs it recently announced. Trump proposed $50 billion last week at 25% and China countered with $34 billion in new tariffs. This is rapidly reaching a critical point. This could become the straw that breaks the market's back if the severity of tariffs continues to get worse and the retaliation from both sides gets out of control. 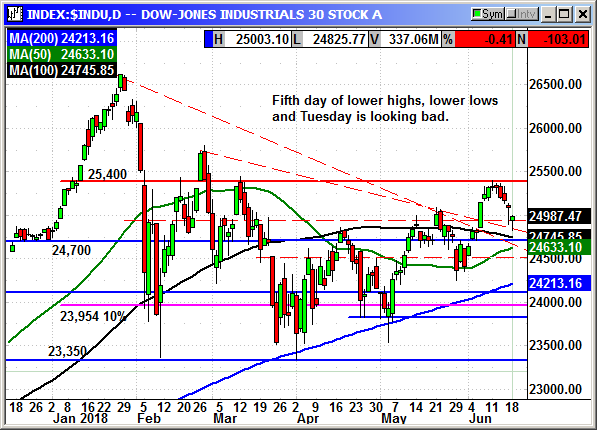 The Dow and S&P are struggling and another 250-point drop on Tuesday could push already cautious traders to head to the sidelines and dip buyers may decide to pass on the next dip. The Dow posted its 5th consecutive day of lower highs and lower lows. 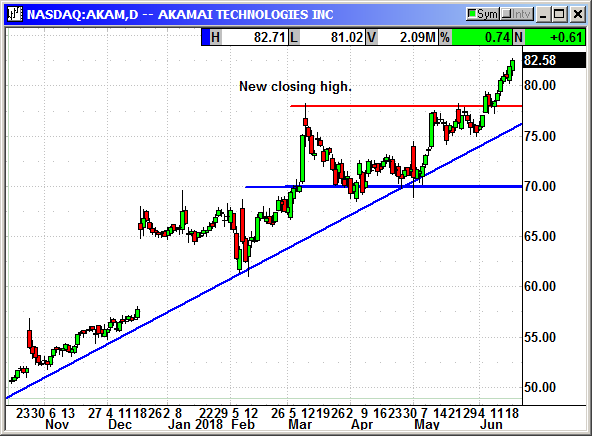 Another 250 point drop would put it back at the prior strong resistance at 24,700, which should now be support. 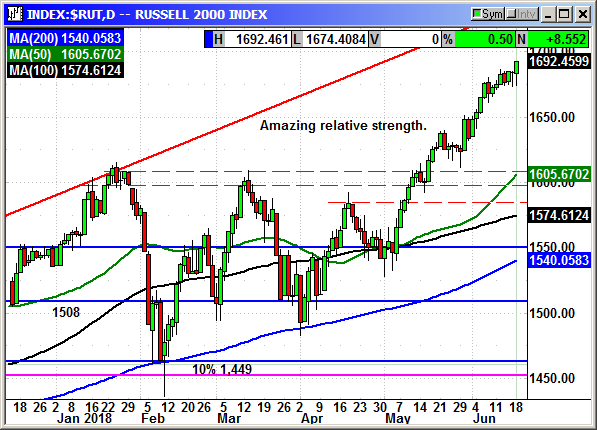 The 100-day average is 24,745 and that could also be support. However, if the negative headlines appear to be increasing, there could be a deeper dip in our future. The S&P had a strong intraday rebound of 16 points but could not make it back to positive territory. 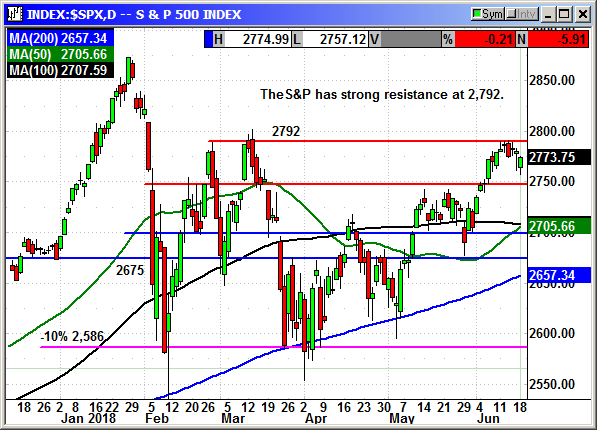 Prior resistance at 2,750 should be support and the futures are currently at 2,755. If we blow through that level, we could see 2,700 again. 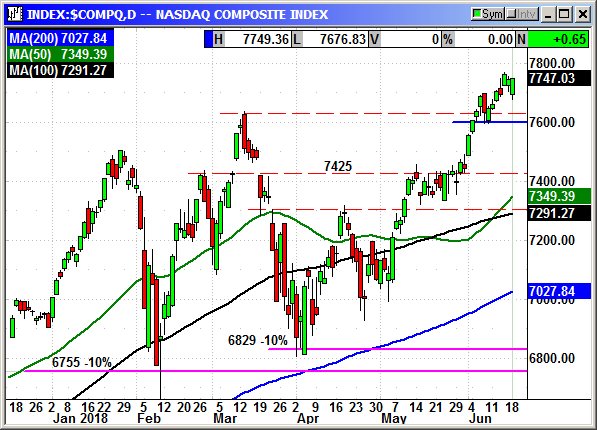 The Nasdaq managed to rebound 71 points to close fractionally positive. 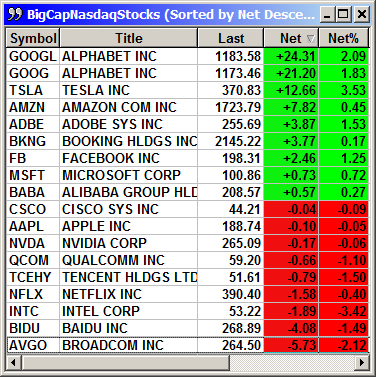 The big cap techs were evenly mixed but the small cap techs were on fire. Tesla rallied despite negative analyst comments. I think everyone believes they will hit their 5,000 per week target on the Model 3 by the end of the month. The Nasdaq has held at the recent highs for the last three days. 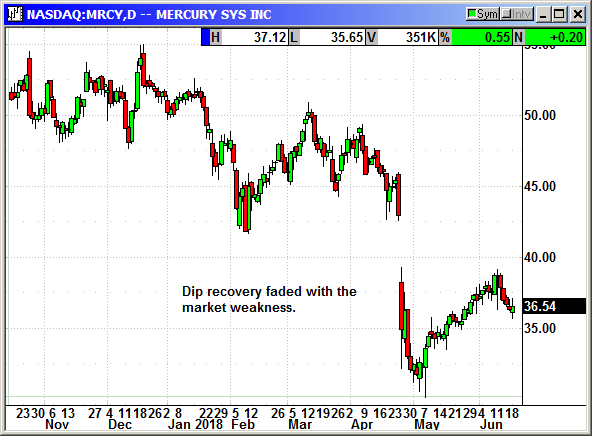 This is great relative strength but the 70-point decline was definitely a sentiment challenge while it was happening. Nasdaq futures are down -74 points on Monday night. The Russell 2000 remains the market leader because the small caps are immune to tariff threats. This index is definitely overbought but that does not seem to be worrying investors. 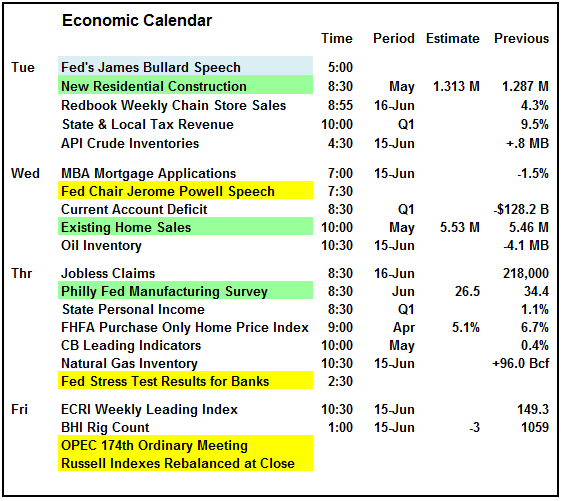 The calendar for Tuesday is lackluster with only one material report and that is new home construction. The Fed gets another chance to tank the market on Wednesday when Chairman Powell speaks before the open. Oracle reports earnings on Tuesday and they get a chance to rebut the JP Morgan downgrade from last Thursday that crashed the stock. FedEx earnings will tell us if the economy is still strong. Shipping is the lifeblood of commerce. When shipping slows, the economy is slowing. I would avoid buying the opening on Tuesday. We really need to wait for the tariff headlines to calm and the appearance of a deal in progress. We may get a rebound tomorrow but the next headline could push it even lower. The severity of the headlines is increasing. That means market reaction will also increase. Be patient. Wait for a change in sentiment. With the S&P futures down -24 points, I am not adding any new positions today. 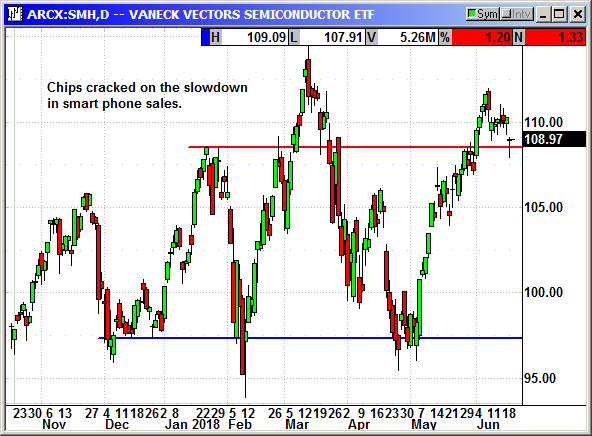 The June long call position expired on Friday. No specific news. 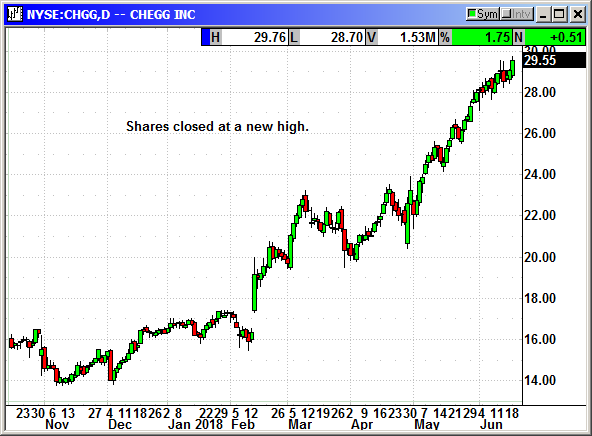 Shares closed at a new high, again. No specific news. New closing high, again. IBM announced the acquisition of Oniqua Holdings Pty Ltd, based in Denver. Financial terms were not disclosed. The 56 person company makes software to track maintenance and spare parts inventories in oil and gas operations, mining, utilities, transportation and similar industries. A study by the Aberdeen Group found that half of unscheduled downtimes was due to a lack of spare parts in inventory. IBM sees this acquisition as a way to bolster their IoT movement. 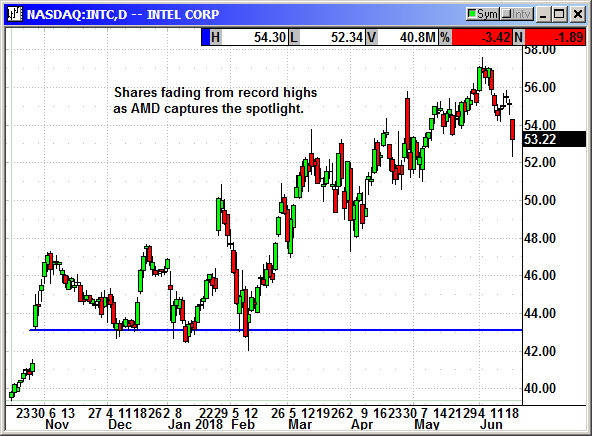 Long August $150 call @ $3.13, see portfolio graphic for stop loss. No specific news. We closed our June option at the open on Tuesday. 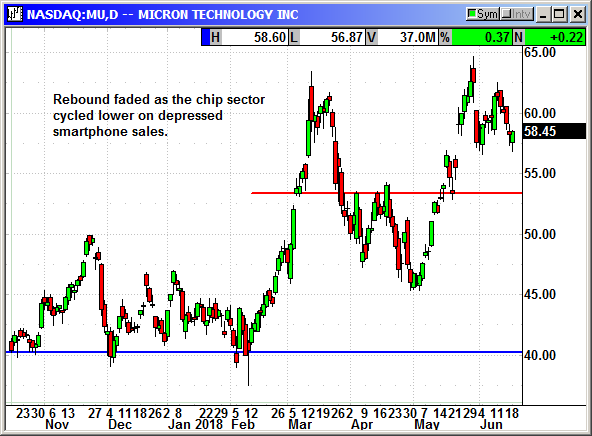 Closed 6/12: Long June $55 call @ $2.07, exit .59, -1.48 loss. No specific news. Company received $2.1 million electronic warfare module order for airborne application. The rebound faded slightly with the weak market. 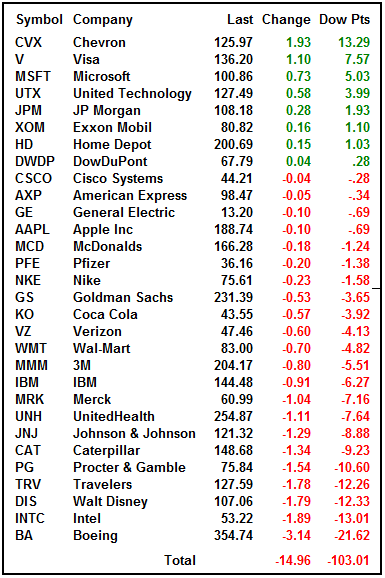 After much consternation I am going to recommend we hold over the earnings report on Wednesday after the close. The last two reports saw large post earnings gains. They have already guided higher for Q2. However, there is $3 at risk. If this does not fit your risk profile, please exit. We closed the expiring June position at the open on Tuesday. 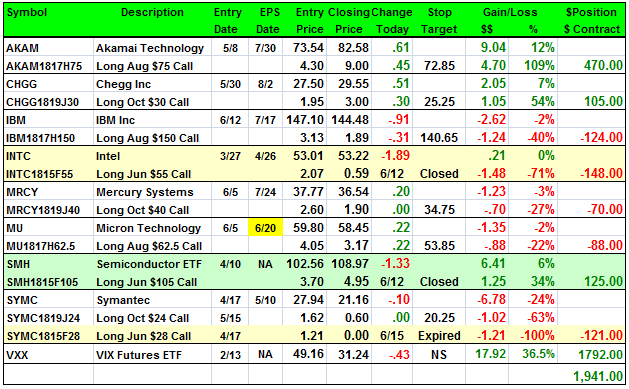 Closed 6/12: Long June $105 call @ $3.70, exit $4.95, +1.25 gain. No specific news. The June option expired. 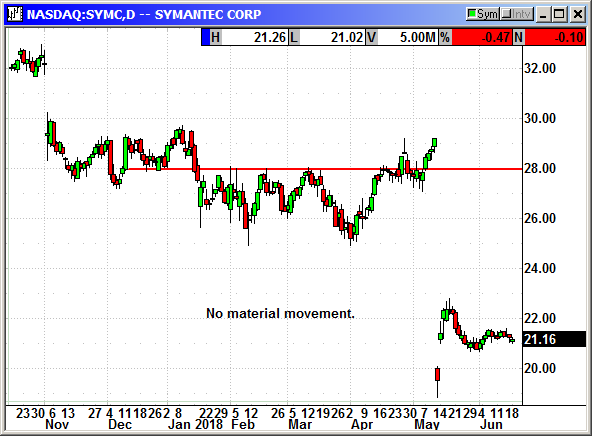 This position was entered before the crash so it had no chance after that gap lower. 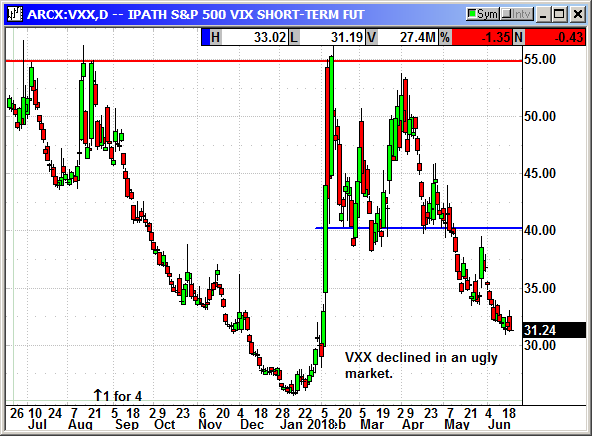 Volatility has fallen below $32 and a 4-month low.